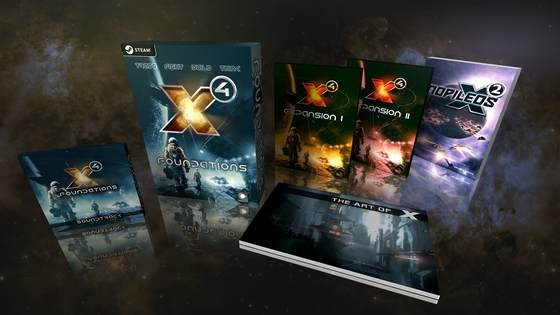 EGOSOFT is very happy to announce the release date for the long awaited 4th part of the X series: X4: FOUNDATIONS will be available on Steam, GOG and egosoft.com on November 30th 2018. 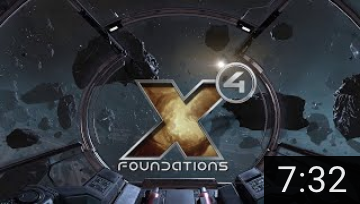 X4: Foundations will feature an extremely large universe from day one. Home to several factions of the Argon, Teladi and Paranid races, each with multiple complex economies. The Paranid, for example, are a race with very deep religious beliefs, fractured into two competing empires and now raging war against each other. Then there are of course also a lot of other potential adversaries: Those where you have a choice, like different Pirate factions, and those where you don't, like the infamous Xenon: A race of advanced artificial general intelligence, once built by mankind themselves to help colonise space. There will be Expansions, which will bring more races, their ships, stations and lots of missions into the X4 Universe. Our goal is to bring the first big Expansion within about one year. Please note: The following system requirements are only estimates. There's a good chance that these requirements will change until release. Whereby we consider the minimum requirements already fairly stable. What system can you recommend X4 runs well on? We cannot make any specifc hardware recommendations, since the system requirements are not set in stone yet and "running the game well" is both subjective and dependent on the in-game context. In this kind of game the term "minimum framerate" is also completely meaningless. Put yourself in a situation where there is enough going on and it will start to slow down, because we don't artificially limit how much can happen in one place at one time, and of course the universe simulation will be going on in the background regardless. So it's safe to assume that there will be some variation in framerate in X4, depending on where you are in the game and what you are doing. About the Operating System (OS): X4 requires a 64bit operating system. About the processsor (CPU): The game has a similar threading model to XR. It will use two cores pretty heavily, for its core activities, and a few others more variably for other tasks. There is no fixed limit to how many it will use for those other tasks, but at the same time just increasing the number of cores won't necessarily improve performance beyond a certain point. With current-generation CPUs, which can usually run at least 8 threads on 4 cores, you will probably gain more from a higher core speed than from adding more cores. About the graphics card (GPU): Vulkan support is required, whereby this is provided by the majority of modern graphics cards. This, however, does not mean that any graphics card that supports Vulkan also runs the game. Onboard chipsets like Intel HD Graphics or Iris are not supported. Mobile cards, which you usually find in laptops, might be able to run the game. However, please note that those cards are usually less performant and have fewer features than their desktop equivalents. For example a Nvidia GTX 780 (desktop) is not the same card as a Nvidia GTX 780M (mobile, note the M). About the storage (HDD vs. SSD): As with most games, fast disk access will give the most benefit when starting X4. It can also help to reduce the incidence of assets "popping in" as they load during the game, though we do try to prevent that as far as possible with appropriate hinting anyway. As for the amount of disk IO, that's all about asset loading, not the simulation, and will vary depending on what you are doing. How do I know, whether my system can run X4? Start by looking at the System requirements posted above and compare the cagetories operating system (OS), memory and storage with your own system. If either of these do not meet the minimum requirements, you won't be able to run the game. Comparing processor and graphics card will be more difficult, as there is a great variety of those which also give different performance results depending on the overall system and usecase. The best we can suggest is looking for general benchmarks comparing your CPU and GPU with the ones from the System requirements listed above. If you're still unsure about your system's performance, then feel free to discuss the system requirements with our community in this forum thread. If you're planning to build/buy a new system and need feedback, then please open an own thread in the Off Topic forum. We definitely plan to support Linux. If a Linux version will be released from the start or a little later will be decided close to release. It's something used to adjust the appearance of a ship. It can consist of a number of attributes, colour being the most important. Other features of paint mods I will leave to be announced more formally. A paint mod consists of a set of attributes. You can't pick and choose which ones get applied. Will the paint-mod, which you get when preordering the Collector's Edition, be part of the normal game? You won't get this particular paint mod with the game if you don't pre-order, otherwise it wouldn't be "exclusive" as described in the announcement. The paint mod feature is of course part of the game for everyone, however. Are there other paint mods in the game other than the standard and exclusive one? Do I have to order the Collector's Edition from the Egosoft shop in order to receive the additional items? The items are part of the digital Collector's Edition. It doesn't matter where you buy it. Is the Collector's Edition limited? The digital Collectors Edition will certainly be available after release, but as per the announcement, the exclusive paint mod is a pre-order bonus. Also, the pre-order price is discounted so it will be slightly more expensive then. How do I connect my Steam account with my Egosoft account? Click on your name at the top right corner of the forum, choose User Control Panel from the list that drops down, go to the fourth tab called "Egosoft Settings", then the second sub-tab called "Game Registration". The Steam link option is there. Do I have to connect my Steam with my Egosoft account already prior to release in order to receive the exclusive paint mod? No, as long as you preordered the Collector's Edition (i.e. bought it before release), you will receive the paint mod, no matter when you connect your accounts. How do I get the exclusive preorder paint mod, if I preorder the Collector's Edition from GOG? You will receive an X4 registration key, which you can use to register your game in the forum. Which Format (epub, Amazon Kindle, pdf etc.) will the eBook have? This is not decided yet. A pdf version will most-likely be included. Will X4 only be released on Steam? 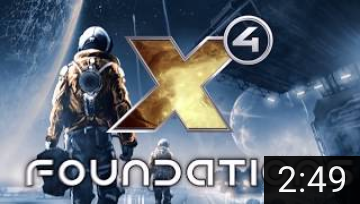 X4: Foundations will be released simultaneously on Steam and GOG. A NoSteam.exe for XR was first made available a year or so after the game's release. We cannot say when this will be the case for X4, though. Will there also be a boxed version of the game (be it the normal version or the Collector's Edition)? There are no plans for a boxed version of the game, Collector's Edition or otherwise, in the foreseeable future. I want to support Egosoft. Should I order from the Egosoft shop? Buying from the Egosoft shop is still the best way to support Egosoft. The choice is yours where you buy from, though, of course. I have preordered the game through the Egosoft shop, but haven't received an email with my Steam key yet. What should I do? This is normally a case of overzealous spam filtering or AV software. Therefore please first check your spam folder. If you've done that and are sure you didn't receive the email, then you can email order@egosoft.com with the details of your order and someone will look into it for you. Pre-ordered the Collectors edition already! I must be a man of faith. Woohoo finally the announcement we've been waiting for! Thanks Egosoft for continuing this amazing series, and never being too scared to push on with new ideas and new game mechanics to keep things modern and fresh. Both videos looks amazing!! Already pre-ordered the collectors edition! Ohh I was hoping a fisical box! Anyway Thanks for this amazing new game!! I went to the steam store by following the link, I have no option to buy/pre-purchase any version, neither can it be found at Gamersgate. UK player. Also collectors for me. You have actually managed to restore my faith. Surprising on this day and age. Thanks, but it would have been nice if they had mentioned Steam weren’t taking orders yet, not all of us follow Twitter. This minor miscommunication does make me re-evaluate my purchase plan though. If they get minor thinks like this wrong is this going to be another Rebirth Disaster. First thing on my to-do list when I get home from work. Was considering to wait for word on a boxed version but what the heck. 75 bucks for the base game plus the first two expansions included sounds like a pretty decent deal! I find the price for the collectors edition a bit too high considering all those "free" items with it are "digital"
I have this funny feeling their international distribution will price gouge us New Zealanders and Australians. The exchange rate with the US is 0.66, the lowest its been in 3 years. So $60 US would be $100NZ and I am NOT paying anywhere near that price for a computer game. Last edited by DaMuncha on Mon, 1. Oct 18, 15:12, edited 1 time in total. Correct. Steam have been informed and it should hopefully available soon. The timezone difference is probably the main reason for the delay. Nice to see that everyone has their pitchforks ready though. For thus, its a bargain. Something to think about regarding preorders on Steam. That is quite a risk for Egosoft if you think about it. So either Egosoft hasn't considered this risk, or they're "pretty sure" there won't be many refunds on release. Split say NEED MORE FIREPOWER!! I don't know, assuming relatively small expansions (like Rebirth's) for 10 euros each, that means you're only paying 5 euros for the extras. Seems all right.